The Carri Chef BBQ/plancha combo comes with the new BBQ/Plancha top: half BBQ, half plancha. Also included are a pot stand and a dome with thermometer. More tops are available as optional accessories. The Carri Chef 2 is an easy to build, easy to use, easy to clean and simple to store outdoor barbecue. The powerful round stainless steel burner with piezo ignition offers finely adjustable temperature control ensuring consistent results on the grill. Lid off for grilling, lid on for in-direct oven type cooking. The dome has a thermometer which allows you to oven roast, smoke meats, steam or bake with confidence. Your CADAC barbecue is guaranteed by CADAC for a period of 2 years against factory fault. CADAC ThermoGrill® causes an even heat distribution, quick heat up time and less gas consumption. The “U” Grills on the patio ranges and the specially designed grids with integrated flame tamer / heat diffuser for the camping range, traps and distributes the heat evenly which ensures even cooking temperatures, so there are no cold spots on your braai grid. CADAC barbecues are easy to assemble. Our patio grills can be assembled within 30 minutes, because of its smart construction, a limited amount of spare parts and a clear manual. Our portable barbecues are ready to use in a minute, no need for any tools. 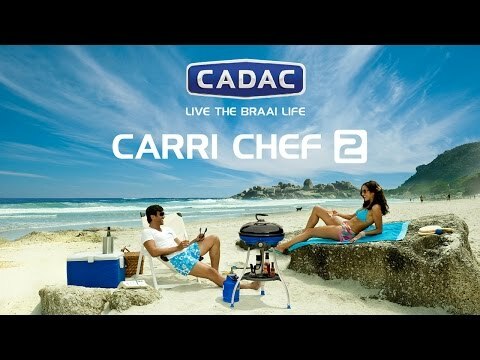 So buy a CADAC and you will save time to enjoy the braai life! The burner box of CADAC patio barbecues have clean and smooth inside surfaces made from enamel coated steel or coated aluminium. The Easy Clean System enables water to drain off in a removable fat drip cup. With the telescopic hose the water will flow into a bucket. Our cooking tops have a non-stick coating, making them easy to clean. Our portable barbecues have an enameled fat pan that can easily be removed and washed. Cleaning has never been this simple; just use a sponge and some water with detergent. Most of our cooking surfaces are supplied with a ‘CADAC GreenGrill coating’. This ceramic coating is made from organic materials and doesn’t contain any toxic substances. The CADAC GreenGrill is much more durable and harder than normal non-stick coating. It resists higher temperatures, divides the heat better and holds this heat, so less gas is used while grilling. Cooking tops are very easy to clean with some water and detergent. CADAC products are known for their MODULAR SYSTEM; our barbecues can be used with many different cooking tops, making cooking in the outdoors even more fun. With a CADAC you fry more than just a hamburger on your grill!